You are here: Home / branding / You Are Not Better! You are not better than anyone else. Your business is not better. Your product is not better. Your service is not better. The quality isn’t better. The knowledge isn’t better. It’s just not better. And you know what! It doesn’t matter!!! See, business and marketing is not about being better. Heck, how would you even define better? What I think is better may not be anything like what you think is better. What I think is better today may not be what I think is better tomorrow. What is better for this occasion may not be better for another occasion. All too often when you talk to entrepreneurs and business owners and ask them why you should do business with them rather than anyone else, they will tell you that is because they are better. What you need to be is different. 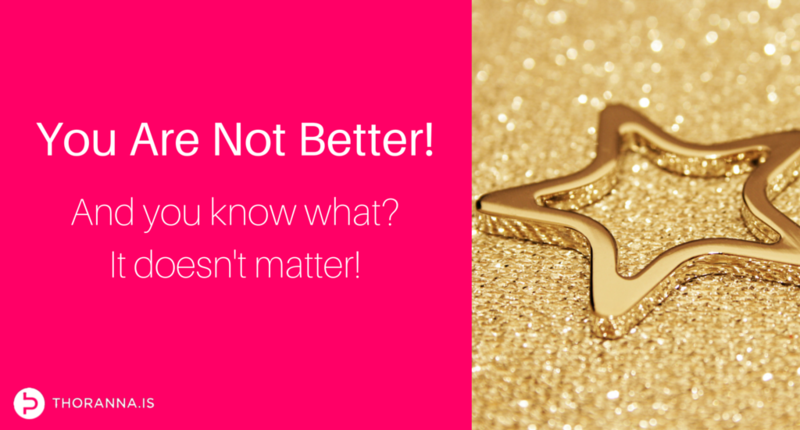 Different in a way that matters to someone – preferably your target audience. You need to be brave and stand out! If you could find a neutral tech person they would tell you that Apple is not better. If you could find a neutral person who knows anything about black sugary fizzy drinks they would tell you that Coke is not better. If you could find a neutral person who knows about tailoring they could tell you that Armani is not better. Better is in the eye of the beholder and has nothing to do with whether things really are better but merely whether they are perceived to be better. Better by being different in a way that matters to whoever beholds it at that particular moment in time. So don’t try to be better – it won’t work. Be better at being different!